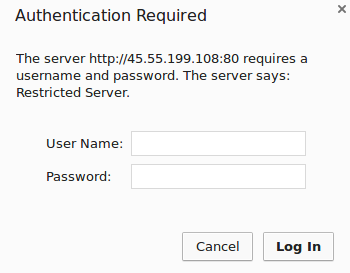 When setting up a web server, there are often sections of the site that you wish to restrict access to. Web applications often provide their own authentication and authorization methods, but the web server itself can be used to restrict access if these are inadequate or unavailable. In this guide, we'll demonstrate how to password protect assets on an Apache web server running on Ubuntu 14.04. To get started, you will need access to an Ubuntu 14.04 server environment. You will need a non-root user with sudo privileges in order to perform administrative tasks. To learn how to create such a user, follow our Ubuntu 14.04 initial server setup guide. In order to create the file that will store the passwords needed to access our restricted content, we will use a utility called htpasswd. This is found in the apache2-utils package within the Ubuntu repositories. We now have access to the htpasswd command. We can use this to create a password file that Apache can use to authenticate users. We will create a hidden file for this purpose called .htpasswd within our /etc/apache2 configuration directory. You will be asked to supply and confirm a password for the user. Now that we have a file with our users and passwords in a format that Apache can read, we need to configure Apache to check this file before serving our protected content. We can do this in two different ways. The first option is to edit the Apache configuration and add our password protection to the virtual host file. This will generally give better performance because it avoids the expense of reading distributed configuration files. If you have this option, this method is recommended. If you do not have the ability to modify the virtual host file (or if you are already using .htaccess files for other purposes), you can restrict access using an.htaccessfile. Apache uses.htaccess` files in order to allow certain configuration items to be set within a file in a content directory. The disadvantage is that Apache has to re-read these files on every request that involves the directory, which can impact performance. Choose the option that best suits your needs below. You should now have everything you need to set up basic authentication for your site. Keep in mind that password protection should be combined with SSL encryption so that your credentials are not sent to the server in plain text. To learn how to create a self-signed SSL certificate to use with Apache, follow this guide. To learn how to install a commercial certificate, follow this guide.